Most “greenies” like to coin their lifestyle a “trash free” lifestyle. For me, that is just waaay to hard. I think it’s a great goal, but I am not positive I can make it totally trash free in our household. Instead, I am going for a “less trash” lifestyle, where we reduce our overall garbage. 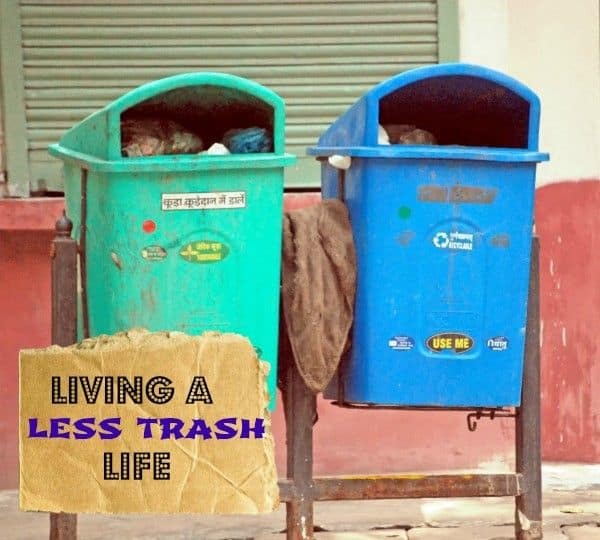 Learning to live a less trash or even a trash free lifestyle isn’t hard. It just requires a different approach to your thinking. You may have to step out of your comfort zone at times to rebuild those relationships that our current disposal lives have torn down. For example, I used to to the big box grocery store, take my shopping cart and hold my head down, staring at either my coupon box or even the floor and shopped all the aisles. I would grab items off the shelves in their neat little packages, place them in my cart and move toward the checkouts. I wouldn’t have to say anything to anyone, unless I couldn’t happen to find an item and needed to ask an employee. Good luck finding one somedays, though, and even when I did, I usually didn’t want to go out of my way to ask, choosing instead to forgo buying that item. I would then take my cart full of goods, and anonymously go through the checkouts. Have you noticed that the self checkouts are far busier these days than going through the cashier regulated checkouts? I am sure that many people are like I used to be and not want to be bothered possibly having conversation, or not wanting to deal with a less than efficient cashier, or even one having a bad day. I would pack them up in plastic bags, and slide my debit card in the slot, and be on my merry little way. I would not have had to have any conversations with any person along the way, no human interactions. Convenient little packages made that possible for me. While I believe that the internet is awesome, we use it to hide. We hide behind our facebook and twitter accounts, and bloggers can sell only the good parts of their lives and days. We no longer know our neighbor’s names, let alone have a relationship with people in our grocery stores. We have allowed technology to replace names and faces and human interaction. And, we are paying the cost. So, how does a trash less lifestyle differ? Well, since I take my own containers to the butcher shop, and market, I am forced to talk to the people behind the counter. I have to ask for what I want, and how much. It’s not as easy to hide. When I use the self checkouts, I have to have my reusable bags “checked in” by the cashier. I am much more in touch with our food, where it comes from, and who grew it. 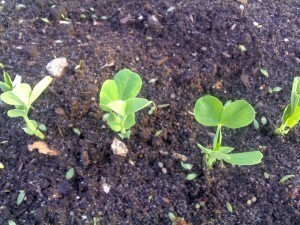 I know all about our produce and how it was raised, from seed to my kitchen. I am quite familiar with the cows that provide our milk and have actually petted them before. I am on a first name basis with the chickens that lay our eggs. I know the people who work behind the deli counters by name, and I am able to ask about their days or things going on in their lives. There is a deeper sense of community, and of belonging. I am not saying you can’t have that with the packages, it just makes it harder to accomplish. Stepping out of my comfort zone in order to get to know people at the grocery store, or the farmer’s markets, or at the farm where we get our milk wasn’t easy for me. I am by nature an extrovert, and I enjoy talking to people, but it was never easy to make the first move so to speak and get the conversation rolling. Working toward a less trash lifestyle has forced me to have that human contact again. Living this lifestyle, and working toward the end goal of zero trash has also changed our eating habits. I no longer depend on easy to fix or quick meals. I have to think about our meals in advance, and actually cook from scratch. I have learned to be quite creative and have learned to love cooking again. We save money because we eat out much less, and actually use all the food I buy vs. having food enough to spoil. And, as an added bonus, my family consumes much more fresh fruits and veggies than ever before. Our journey isn’t going to be like yours. Our family makeup, food styles, and likes/dislikes are not yours. But, it is my hope to spur on some ideas for you to change some things. Like wasting less food, using less plastic, and saving money on many common items. There will be recipes, how tos, and helpful hints along the way. Come join me, won’t you? Pretty difficult to live a trash FREE life.. I think most of us could cut back somewhere.